Through recognizing and sharing the success stories of today’s female leaders, our Leadership Programs inspire and cultivate acts of courage in others. 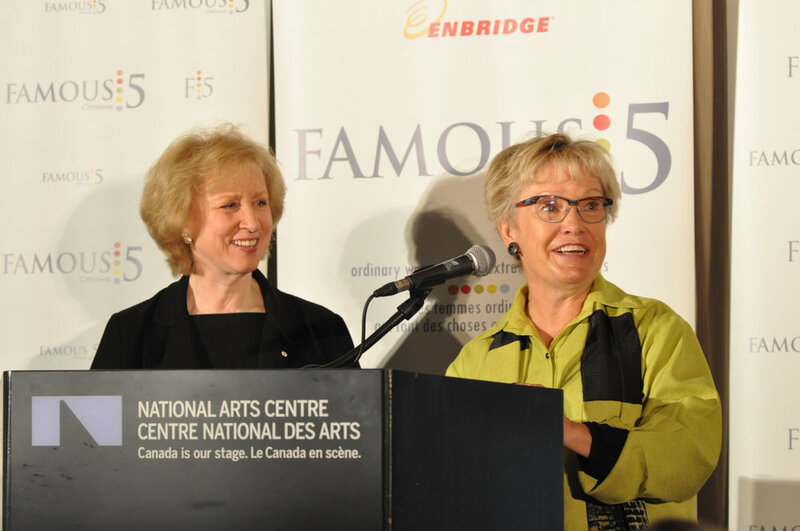 Famous 5 Ottawa celebrates the achievements of all women by putting names forward for local, provincial and national awards. In Ottawa, more than 40 Famous 5 volunteers are amoung the many women who have received the Province of Ontario Leading Women Building Communities Awards. One of our members was a first recipient of the prestigious Order of the City of Ottawa. We encourage the nomination of women in all aspects of life, and facilitate and promote their achievements. 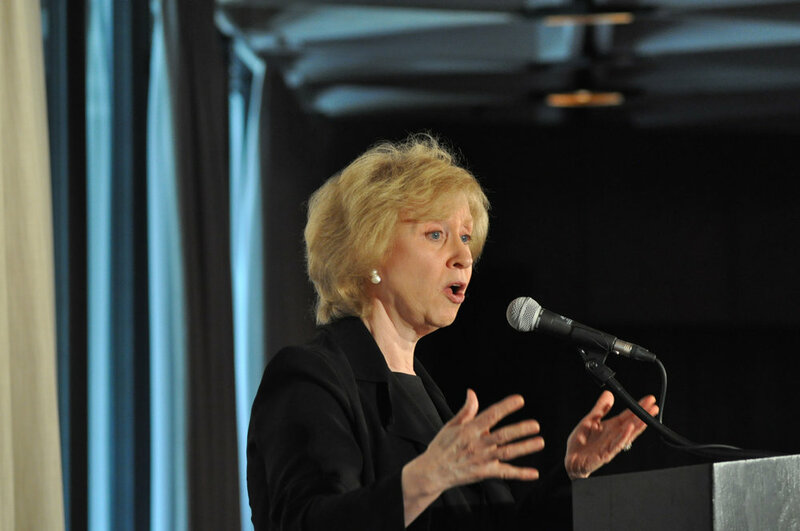 The Enbridge Famous 5 Ottawa Speaker Series profiles extraordinarily successful women. Our speakers talk candidly about their leadership journeys, and about the passion, vision and determination that drive them. They discuss our role in our society and the ethical responsibilities and consequences of our actions. In partnership with Norton Rose Fulbright LLP, the Famous 5 Ottawa Committee offers a mentorship program with the aim of helping young women develop the skills for career development and advancement by pursuing speaking opportunities and presence at events. Through mentoring and coaching, Famous 5 believes that young women should be at the front of the room speaking, and not just at the back of the room organizing. The Committee organises the Enbridge Speakers Series where we honour women as nation builders. Each mentee is given the opportunity to introduce the woman, or panel of women, being honoured as nation builders at an event held during the year. The Committee is currently seeking applications to fill up to three mentorship spots for Spring and Fall 2019. The successful candidates will receive a scholarship, participation in a presentation skills workshop, as well as guidance from and connection with the members of Famous 5 Ottawa and past mentees. Famous 5 Ottawa is planning an exciting agenda for our 2019 speaker series events. We are interested in hearing from young women of all backgrounds under the age of 35, who are within the first five years of their career, have been involved in the Ottawa community, and are passionate about the values and mandate of Famous 5 Ottawa. The application process will involve an interview before final selections are made of the successful candidates. be able to incorporate French in your speaking remarks. Interested applicants can send their CV and a letter of interest to Audrey Tong (audrey.tong@carleton.ca). Questions about the program or application process may be sent to both Audrey Tong or Tiffany Glover (tiffany.glover@gmail.com), the two Co-Chairs of the Mentorship program. You can also visit www.famous5ottawa.ca for more information about our Committee. The deadline to apply is November 30, 2018 at 5pm. 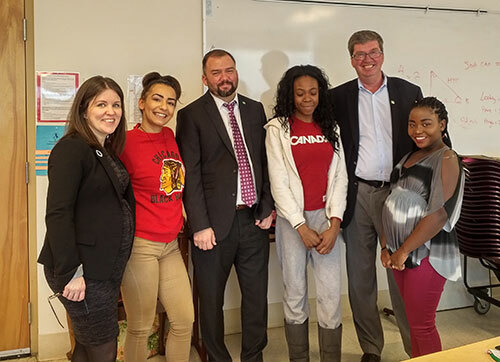 Famous5 Ottawa is partnering with TD Bank on a monthly Lunch and Learn program at Youville Centre aimed at motivating pregnant and parenting adolescent mothers with stories of inspiration and encouragement. Youville Centre, based in Ottawa, provides young mothers with crisis intervention, intensive mental health therapy and treatment, parenting programs, a licensed child development program and a fully accredited secondary school. The TD Bank Famous 5 Ottawa Lunch & Learn Program at Youville brings in women from the community to chat about their lives and career paths in areas such as the trades, the armed forces, government work, entrepreneurship and other vocations. The goal of the program is to provide encouragement, suggest skill development and practical strategies, support goal setting and share stories of overcoming adversity as women. Youville has applauded the contribution by TDBank and Famous5Ottawa and says the program is a big success that is helping young mothers be inspired by women in the community who have experienced real life challenges. Famous 5 Ottawa luncheon will also acknowledge the women who have been awarded the Leading Women Building Communities Award by the province of Ontario. The Famous Five – Emily Murphy, Louise McKinney, Nellie McClung, Henrietta Muir Edwards and Irene Parlby – opened the doors of the Senate of Canada to women through the Persons Case, a milestone in Canadian legal history. Famous 5 Ottawa honours women who, like the original Famous Five, are Nation Builders; women who through their leadership and courage have advanced the cause of equality for all in ways that have enriched our communities and our country. Famous 5 Ottawa will honour these women – Jenni Byrne, the Conservatives’ campaign manager, Anne McGrath, the NDP’s campaign director and Katie Telford, the Liberals’ campaign co-chair – as nation builders at a luncheon March 9, 2015 at The Westin Ottawa Hotel. 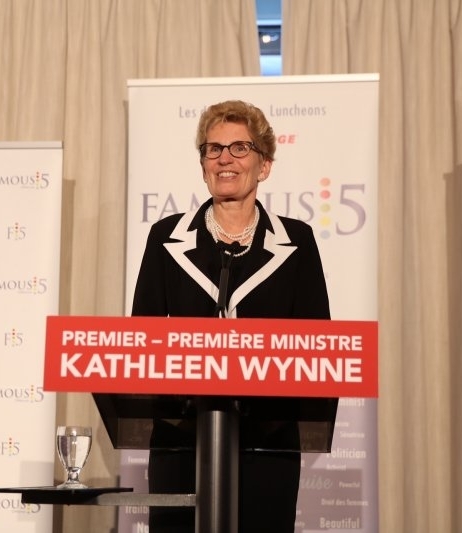 “As women leading their respective political parties for the upcoming national election, Famous 5 Ottawa will celebrate their achievements at the national level and the work they do to support those in public life,” said Isabel Metcalfe, chair of Famous 5 Ottawa. LeBreton is a good friend of Famous 5 Ottawa. In 1998, she seconded the motion for the Senate of Canada to approve the placement of the Women Are Persons! monument on Parliament Hill. It commemorates the efforts of the original Famous Five Alberta women – Emily Murphy, Nellie McClung, Irene Parlby, Henrietta Muir Edwards and Louise McKinney – for the political battle they fought to secure the right of women to serve in the Senate of Canada and beginning a long road of constitutional change in Canada.